I've been the Director of the Brandywine Conservancy for a year and a half now, and if there is one thing I’ve noticed above all else in my time here it's that the Brandywine Creek—and the lands, natural, and cultural features in and around this Valley—is cherished. On so many levels and in so many ways, the care and concern over open space, clean water, forests and agricultural lands, and the connection of people to the land and water in the places where the Conservancy has been doing work all this time is astounding, and heartwarming. The Brandywine Conservancy has been caring for the greater Brandywine Creek Valley for 50 years now, and the momentum has not plateaued at all. We were working with landowners to protect their lands 50 years ago and we are doing this same work today, along with so much more. In this issue of Environmental Currents, you will read about our continuing work, alongside so many partners, toward a clean Brandywine at its source; building a rain garden in Honey Brook, the headwaters of the Brandywine; elevating our message and mission to those wonderful cyclists and volunteers who braved Bike the Brandywine for the second year; our upcoming Holiday Subscribers Meeting that will feature a presentation by Professor Frederick Steiner, Dean of the University of Pennsylvania School of Design; our stewardship outreach in raising awareness of the very real threat of the Emerald Ash Borer to our forests; and of course, working with a local community on the Twin Bridges Rural Historic District. The lands and water in the areas we work are fortunate indeed to have wonderful people like you as part of their care and future. And we are fortunate to be part of such great partnerships. On behalf of the Conservancy, thank you for your support of our work. Without your critical backing, we cannot fulfill our mission. It is exciting to think of what the next 50 years will bring! Over the past ten years, the Brandywine Conservancy has been conserving farmland in Honey Brook Township, where the Brandywine begins. Over $7.9 million has been spent in the headwaters to permanently protect 27 farms spanning 1,750 acres with agricultural easements in partnership with the county and township. Over 30% of the township is now forever protected in some way. In addition to protecting the land from development, the Conservancy has been focused on improving water quality at the source of the Brandywine Creek. Working with the farmers of this predominantly Plain Sect community, Conservancy staff has helped improve their agricultural operations to be more productive and retain their rich soils, which allows for the opportunity to make significant improvements to the quality of the water in the Brandywine by minimizing polluting runoff into the headwaters. Through grants from the William Penn Foundation, the National Fish and Wildlife Foundation, and others, the Conservancy has been able to design and underwrite dozens of farm conservation plans, which are in essence blueprints for managing the farms to be the most productive and least polluting. The Conservancy works closely with the local farmers and agricultural consultants to develop whole-farm restoration plans where a suite of water-protecting best management practices (BMPs) are proposed. Implementing BMPs, such as fencing off streams, planting forested streamside buffers, controlling stormwater runoff from barnyards, properly managing manure, using no-till and contour plowing, and planting cover crops are some of the best ways to protect and actually improve water quality. Conservancy staff then coordinates applications to NRCS (Nature Resources Conservation Service), PennVest, PA DEP, PA DCNR, and others to fund implementation of the plans. To date, the Brandywine Conservancy has secured over $2 million and has directly implemented or facilitated BMPs on over 30 farms. This work is part of the William Penn Foundation’s Delaware River Watershed Initiative (DRWI), an ambitious project launched in 2013 with the intent of aligning over 50 leading nonprofit conservation organizations in a coordinated and collaborative effort to protect and restore water quality in the Delaware River basin. Through a science-informed process, the Foundation identified eight sub-watershed “clusters” where there were known key water quality stressors (loss of forested headwaters, agricultural run-off, polluted storm water, and aquifer deletion) and institutional capacity to make significant impact at addressing these stressors. The Brandywine-Christina River watershed, which includes the Red Clay and White Clay creeks, was one of the designated clusters. The Brandywine Conservancy was selected to coordinate a six-member team of non-profit organizations for the Brandywine-Christina watershed cluster, which includes the Brandywine Red Clay Alliance, Natural Lands, Stroud Water Research Center, The Nature Conservancy of Delaware, and the University of Delaware’s Water Resources Center, to develop a plan for protecting and restoring surface water quality in the watershed. The primary strategies involve land preservation and agricultural restoration on farms in the headwaters of the Brandywine, Red Clay, and White Clay creeks. The team is also working with local municipalities to update their ordinances to better protect their local streams and comply with pollution and storm water runoff regulations mandated by the state and federal governments. Throughout the summer and fall of 2017, the cluster team developed a Phase II Action Plan for continuing our work under Initiative through 2020. The plan refines the strategies to be deployed and the geographic “focus areas” where work will be concentrated. With approval of the plan, expected early in 2018, the Brandywine Conservancy and our cluster partners will be able to build on the momentum we have gained through our continuing efforts in the Brandywine headwaters. We look forward to the day when on-going water quality monitoring will show measurable improvement to stream water quality, and when we can declare the headwaters of the Brandywine swimmable, fishable, and drinkable. A group of volunteers, local leaders, and Brandywine Conservancy staff recently gathered in Honey Brook Township to plant a rain garden at the entrance to Umble Park. Lining the parking lot of this busy recreational land, over 1,500 perennials and seven trees were planted including native grasses, magnolia trees, hydrangeas, and flowers such as Great Blue Lobelia and Joe Pye-Weed. Not only does the rain garden beautify this popular public space, but it also helps absorb, filter, and manage stormwater runoff that flows from the paved parking lot to the nearby West Branch of the Brandywine Creek. Next year, the Township is planning to install an educational sign at the edge of the garden that will inform park-goers about the functions of this green infrastructure, as well as the many species of native perennials, shrubs, and trees on display. 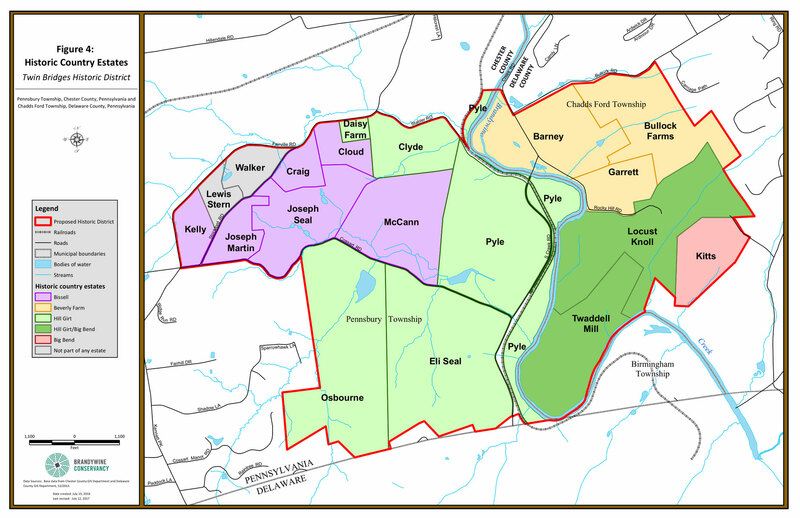 Honey Brook Township is one of twenty-five municipalities served by the Brandywine Creek Greenway, a regional conservation planning effort of the Brandywine Conservancy Municipal Assistance Program. Through partnerships with these municipalities, the Brandywine Conservancy aims to protect and improve natural resources within the Brandywine watershed. The Umble Park rain garden project is the result of a collaboration between the Brandywine Conservancy and the Honey Brook Township Parks and Recreation Committee. Using funds raised from its 2016 Bike the Brandywine event that were earmarked for clean drinking water projects, the Brandywine Conservancy created the landscape design, donated the plants, and hired a contractor to perform part of the installation. The Honey Brook Township Parks and Recreation Committee prepped the site, provided mulch, gravel and water, and coordinated volunteers for the Saturday morning planting event. This partnership culminated in a public planting event with the assistance of over a dozen enthusiastic volunteers. Brandywine Conservancy proudly hosted its second annual Bike the Brandywine on September 30, 2017. Nearly 550 cyclists from the greater Philadelphia region and beyond traversed the breadth and depth of the Brandywine Creek Greenway from Chadds Ford to the headwaters of the Brandywine in bucolic Honey Brook on a bright and windy fall day. Rides of 25-, 50-, and 100-miles offered scenic views of the many beautiful and unique cultural, natural, and recreational treasures the Greenway has to offer. Notable ride locations included Hibernia County Park and Springton Manor Farm, the Struble and East Brandywine Branch Trails, the Brandywine Battlefield, and the iconic King Ranch land. Upon returning, cyclists were welcomed back to the Chadds Ford Historical Society with a free pint of Victory Beer and the cheers and accolades of appreciative staff and volunteers. Bike the Brandywine is a fully supported community bike ride that promotes and supports the Brandywine Creek Greenway and the clean water programs of the Brandywine Conservancy. While organized and hosted by the Brandywine Conservancy, the ride would not be possible without the strong support and commitment from Conservancy partners and sponsors. Especially of note, the Conservancy thanks the Chadds Ford Historical Society and the Western Chester County Chamber of Commerce, the enthusiastic and dedicated band of volunteers who provided support and encouragement to the riders throughout the day, and the many municipalities that the ride traversed through. Planning has already begun for Bike the Brandywine in 2018. For more information and to sign up to be notified of when registration opens for 2018, visit www.bikethebrandywine.org. Exciting news was announced at a recent Friends of Twin Bridges meeting, hosted at the Brandywine Conservancy. Ford Draper, an original organizer of the Friends, announced the formal listing of the Twin Bridges Rural Historic District on the National Register of Historic Places. This newly recognized national historic district straddles the Brandywine and includes nearly 2,000 acres in the southern portions of Chadds Ford and Pennsbury Townships. Staff representatives from the Pennsylvania Historical and Museum Commission (PHMC) also attended the meeting. PHMC staff described the variety and quality of the district’s historic resources that compelled the State Historic Preservation Board to unanimously recommend the National Register of Historic Places designation — kept by the National Park Service. PHMC staff also reviewed the long process before and after their Board meeting which culminated in the new listing. Also in attendance was Jane Dorchester, a West Chester-based Architectural Historian, who did the lion’s share of research and preparation of the formal nomination to the National Register on behalf of the Conservancy and the Friends. The Twin Bridges Rural Historic District draws its name from the bridge that links the two townships near the center of the district. The name reflects a common reference to the tandem “twin” covered bridges that spanned the Brandywine prior to the erection of the current concrete arch bridge. The old name stuck, despite the fact that the “new” bridge is nearly 100 years old and is destined for replacement by PennDOT. This bridge represented early design technology for reinforced concrete and its condition can no longer be rehabilitated to meet today’s standards. Also at the Friends of Twin Bridges meeting, PennDOT representatives presented a status update on the planned bridge replacement, focusing on relative analysis of several alternative design scenarios. Each alternative design still faces hurdles related to environmental issues, conservation easement compliance, potential right-of-way acquisition, and conformance to provisions set by the National Historic Preservation Act — an aspect now underlined by the new National Register status. The Twin Bridges Rural Historic District is relatively unique in its inclusion of a large area of landscape consistent with the historical theme of the district—the American Country Estate. The original three estates—the Bissell Estate, Hill Girt Farm, and the Beverly Estate—are still visually intact, despite changes in ownership over much of the area. The majority of Hill Girt Farm is still owned by the Haskell family, while much of the original Beverly Farm is owned by the Draper Family. The Bissell Estate has been divided, but much is still owned by original family members and is under conservation easement to the Brandywine Conservancy. A portion of the original Hill Girt Farm and adjacent lands were acquired by George A. “Frolic” Weymouth, a founder of the Brandywine Conservancy. Frolic restored much of the property and its historical buildings, and enhanced its consistent character with the historical Country Estate theme, notably in promotion of carriage trails and fords across the Brandywine. While Frolic's efforts began at the very end of the formal period of historical significance (as listed on the National Register of Historic Places), they were noted by the PHMC as important contributing factors to the district’s historical integrity. The vast majority of the Twin Bridges Rural Historic District is permanently protected through conservation easements thanks to the generosity of the landowners who are among the Friends of Twin Bridges. In fact, the very first three conservation easements recorded by the Conservancy fifty years ago are located within the district! PHMC also cited the local conservation history and the legacy it fostered as exemplary aspects of the district’s historical significance.